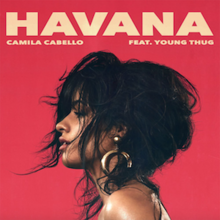 “Havana” was recorded by Cuban-American singer Camila Cabello featuring guest vocals from American rapper Young Thug. It was released in August, 2017, as a single from her solo debut album Camila. “Havana” got to number one in many countries including Australia, Brazil, Canada, France, Mexico, Scotland, the UK and the U.S, and the top 10 of several other countries. Dave Meyers directed the music video. In the video Cabello plays herself as Karla, as well as a telenovela actress and a film protagonist. The Havana video won the Video of the Year award at the 2018 MTV Video Music Awards, and received three other nominations. A vertical video was also released, showing the singer and several dancers in a New York City subway.